Today has kinda been sucky. Found out my car needs more repairs (AGAIN), and I'm trying to figure out how the hell I'm going to keep living off the money I'm (barely) making. It's frustrating, and a huge bummer. 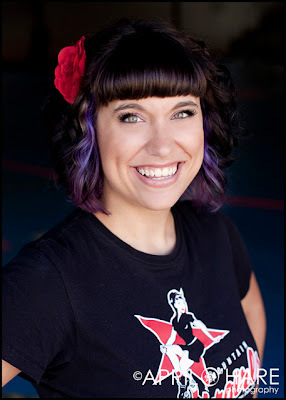 I AM OFFICIALLY A FULL LEAGUE MEMBER OF THE ROCKY MOUNTAIN ROLLERGIRLS!!! Yes, you heard that right! And I couldn't be happier. I still have to pass my skills test (which should hopefully be coming up soon) in order to bout, but the girls felt that my attendance, volunteering efforts, and all-around good attitude made me worthy of being a full-fledged part of the team. So that means I get to pick my derby name and number!! Still not sure what those are going to be yet, so ideas are more than welcome. I'm so excited about that, it's hard to be upset about the cruddy day today! CONGRATULATIONS!! That's so dang exciting. And BOOOO to crapping out cars. I'm right there with ya.